This post is sponsored by Bob's Red Mill, who provided the ingredients and compensation to make this recipe happen! 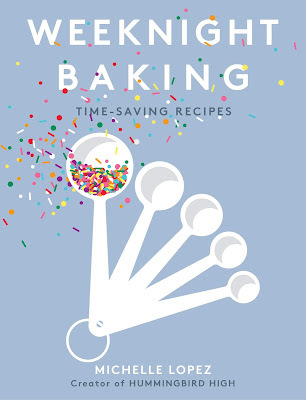 I use Bob's Red Mill products in all my baking, and I'm excited to be partnering with them all year long. Thank you for supporting the sponsors that keep Hummingbird High up and running! At this time of year, it seems that everybody is on some kind of diet except for... me. But I'm not one to judge everybody's resolutions; the new year is as a good time as any to reset and set new goals. To be honest, the only reason I'm not on a diet myself is because I'm still recovering from the Whole30 diet that I did this past summer, mostly by eating lots of peppermint bark leftover from the holidays while binging YOU on Netflix (Has anybody else watched it??? It's so bad, it's good). 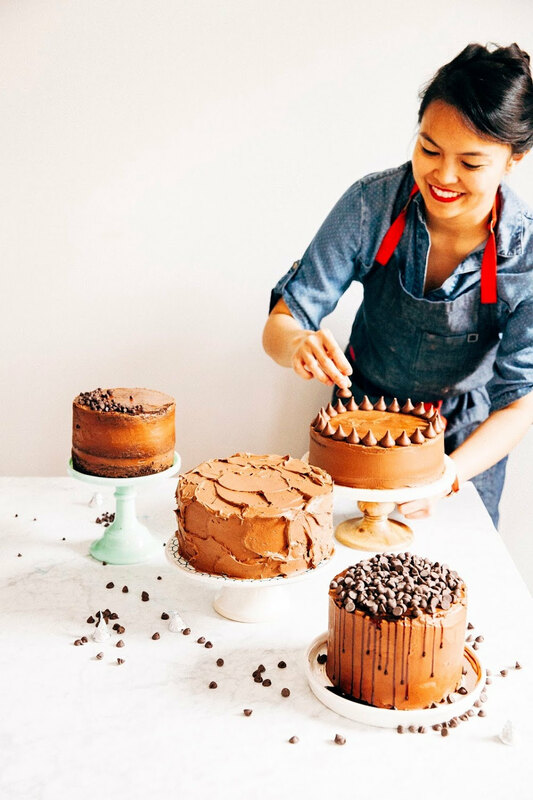 Although I don't have any dietary-based resolutions, the Whole30 did illuminate how much refined sugar I eat — intentionally or otherwise, since refined sugar is literally in almost everything if you're not watching out for it — and it's something I've been more mindful of since. Outside of the sweets you see on this blog, I try and cook us meals that don't use refined sugar, either by skipping it completely or using some kind of fruit juice as a substitute instead. However, when it comes to baking for Hummingbird High, I've stuck mostly to refined flours and sugars (for better or for worse). So this year, I intend to start baking more with alternatives: whole grain flours and nut meals in place of all-purpose flour, honey and maple syrup instead of granulated sugar. Not necessarily because of the health benefits (but what an added bonus! ), but because these ingredients have such wonderful flavors on their own already — like, can you imagine what your favorite chocolate chip cookie would taste like with almond flour and honey? How delicious does that sound? 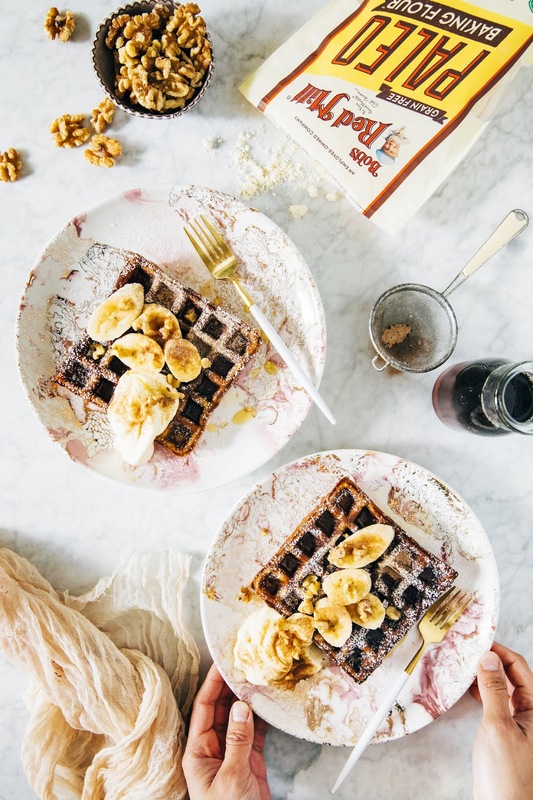 So I'm starting off this intention with this paleo banana bread waffle recipe! I'd heard a rumor that you can cook any banana bread recipe in a waffle iron to make BANANA BREAD waffles. I took my former Crossfit coach's (yes, I used to do Crossfit, lol) banana bread recipe (it's paleo, so it's gluten-free and refined sugar-free) and gave it a shot — it worked!!! 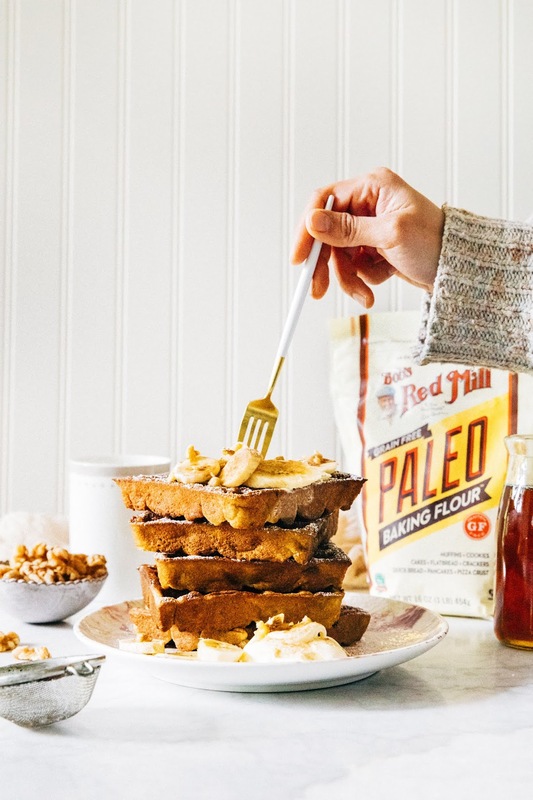 To make this recipe extra effortless, I used Bob's Red Mill Paleo Baking Flour, which takes away the science and guesswork of combining different nut flours and starches. 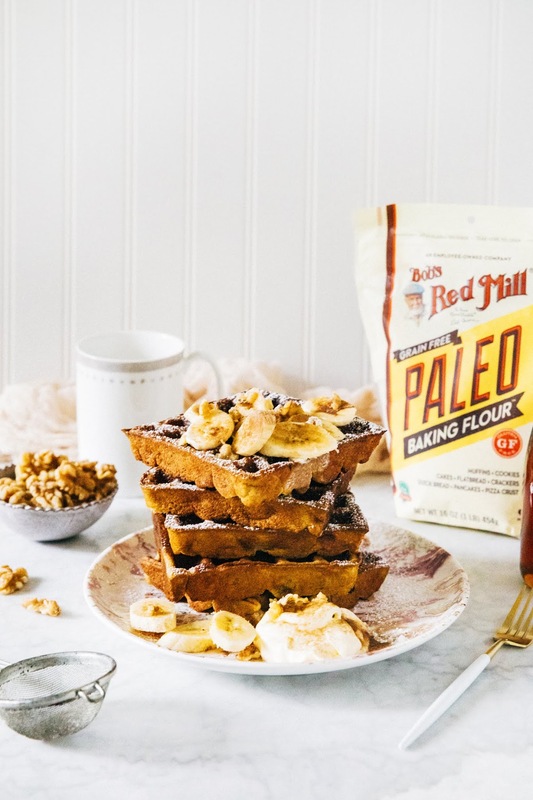 Bob's Red Mill Paleo Baking Flour is grain-free and gluten-free, made of a blend of almond, coconut, tapioca flours and arrowroot starch.The batter cooked up into perfectly soft and fluffy waffles, with a more intense banana flavor than traditional banana waffles. I also think that the almond and coconut flours in the paleo flour gave the waffles a subtle, toasted nutty kick. Mmm. The yield of this recipe will vary depending on waffle maker and how much batter it uses per waffle. I used Breville's 2 Slice Waffle Maker (which I love, love, love), whose cavities require a whopping 1/2 cup of batter to make a single rectangular waffle. If your waffle maker doesn't use that much batter per cavity, you'll end up with more waffles than I did. For this recipe, it's important that you have all your ingredients — specifically, the maple syrup, eggs, and coconut milk if it's been refrigerated — at room temperature. This is because the recipe uses melted coconut oil, which solidifies at temperatures below 76 degrees. Adding cold ingredients to the melted coconut oil will cause it to seize into pebbles in the batter. Other notes about ingredients — I used canned coconut milk, which I shook to vigorously to make sure I got both the coconut water and the coconut cream in the recipe. In a pinch, you can use coconut milk beverage, or even a non-dairy milk like almond, soy, or oat milk. 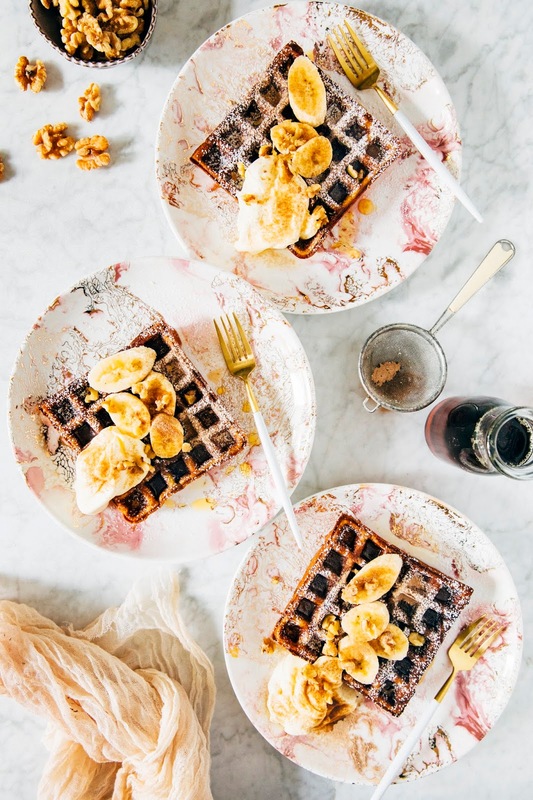 Be sure to use bananas that are SUPER ripe, incredibly spotty and almost black for the most banana bread flavored waffles. Place a sheet pan in the center rack of the oven and preheat to 200 (F). Preheat your waffle maker according to the manufacturer's instructions. In a large bowl, whisk 1/2 cup maple syrup, 1/3 cup melted coconut oil, and 1/4 cup coconut milk. Add 2 large eggs and whisk until until combined. Add 1 cup SUPER RIPE bananas and use a wooden spoon or stiff spatula to mash them into a thick puree and spread the bananas though out the batter. In a medium bowl, whisk together 1 3/4 cups Bob's Red Mill Paleo Baking Flour, 1 teaspoon Bob's Red Mill Baking Soda, 1 teaspoon ground cinnamon, and 1/2 teaspoon kosher salt. Sprinkle the dry ingredients over the wet batter mixture and use the wooden spoon to mix until just combined. Cook the waffles in the preheated waffle maker, using the necessary amount of batter and time recommended by the manufacturer until golden. As the waffles finish cooking, transfer to the preheated oven to keep them warm while you finish cooking the rest of the batter; place each waffle directly on the oven's middle rack. Serve immediately with a dollop of coconut yogurt or coconut whipped cream, with fresh sliced bananas, chopped walnuts, and maple syrup. Enjoy!